National Nutrition Month is sponsored by the Academy of Nutrition and Dietetics (AND) and takes place each March. This campaign helps to bring awareness to nutrition and Registered Dietitian Nutritionists (RDNs) who are nutrition professionals with advanced degrees in nutrition. The purpose of National Nutrition Month is to help people learn about making informed food decisions and developing healthy eating and physical activity habits. 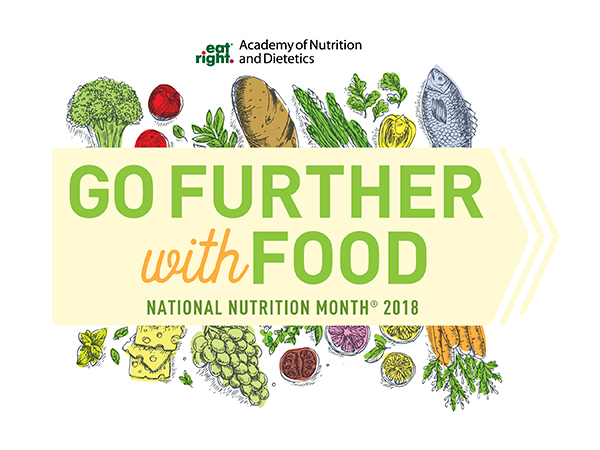 The theme for National Nutrition Month 2018 is ‘Go Further with Food’. This theme has many talking points, from basic nutrition principles of ChooseMyPlate and meal planning to deeper nutrition information about food waste and sustainability. This year’s theme focuses on helping people achieve the benefits that are provided from healthy eating, but also helps bring awareness and action to stop food waste. Also, check out the Utah Beef Council’s participation in the “Food Waste Challenge.” See the calendar below to raise your awareness on food waste and Challenge yourself to implement small changes to fight it!